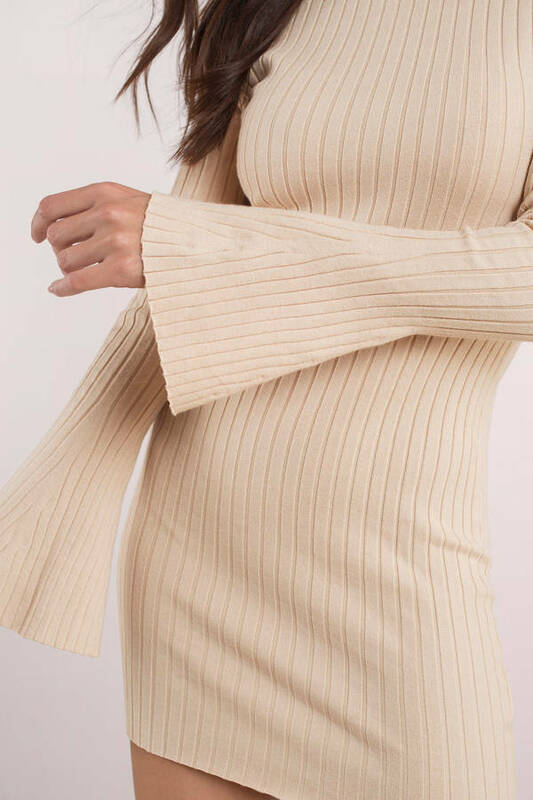 Check out Tobi's Down For You Ribbed Bodycon Dress Bodycon with bells on: you'll feel cozy and cute in the Cream Down For You Ribbed Bodycon Dress. In a chic ribbed knit, the sweater dress has a body hugging fit with a ribbed crew neckline and long bell sleeves for winter drama. Pair this rib knit dress with booties for brunch and more. Bodycon with bells on: you'll feel cozy and cute in the Cream Down For You Ribbed Bodycon Dress. In a chic ribbed knit, the sweater dress has a body hugging fit with a ribbed crew neckline and long bell sleeves for winter drama. Pair this rib knit dress with booties for brunch and more.